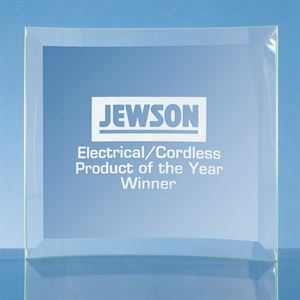 The Jade Glass Bevelled Crescent is a premium clear crystal award with a smooth curved surface perfect for engraving. Made from 5mm thick Jade glass, this superb crescent award with deep bevelled edges can be personalised to display your choice of text and logo engraving. Available in 5 sizes, the Jade Glass Bevelled Crescent can be used as a corporate or sports award or as a personalised display gift for any occasion. A satin lined gift box can be purchased for an extra special presentation. The Jade Glass Bevelled Crescent can be purchased with or without personalised high quality engraving. 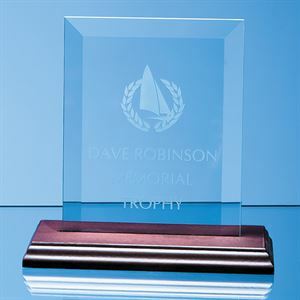 The engraving on your crystal award may also be single colour infilled for a premium, high contrast finish. Simply select this option below and select the fill colour from the drop down list. Made from 5mm thick jade glass, the Jade Glass Bevelled Rectangle with Chrome Pin is a smooth rectangular faced glass award with a bevelled edge and chrome pin stand. Available in a choice of 3 sizes, the Jade Glass Bevelled Rectangle with Chrome Pin can be engraved to display your choice of text and logo personalisation, suited to any special occasion or achievement. Supplied in either a free skillet box or a satin lined presentation box. The Jade Glass Bevelled Rectangle with Chrome Pin can be purchased with or without personalised high quality engraving. 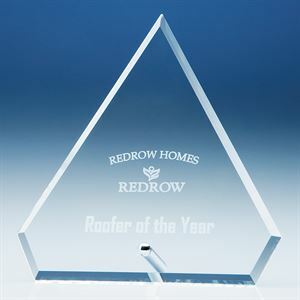 The Smoked Black Glass Rectangle with Chrome Pin is a superb smoked glass award available in a choice of 3 sizes. Set on a chrome pin stand, the Smoked Black Glass Rectangle with Chrome Pin can be engraved with your choice of text and logo engraving, to perfectly mark any occasion or achievement. 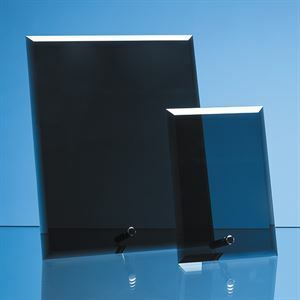 The Smoked Black Glass Rectangle with Chrome Pin is supplied in a free presentation box. The Smoked Black Glass Rectangle with Chrome Pin can be purchased with or without personalised high quality engraving. The Jade Glass Bevelled Edge Circle with Chrome Pin is a circular jade glass award, with a bevelled edge and a chrome pin stand. 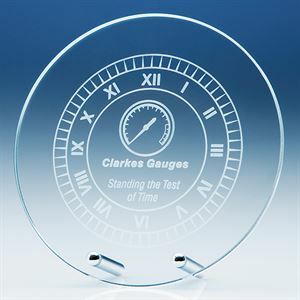 The circular face of the 10mm jade glass award can be engraved with your choice of text and logo engraving, to perfectly mark any occasion or achievement. 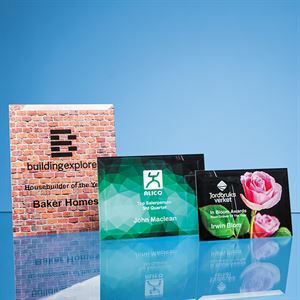 Available in 3 sizes, the Jade Glass Bevelled Edge Circle with Chrome Pin is supplied in a free presentation box. The Jade Glass Bevelled Edge Circle with Chrome Pin can be purchased with or without personalised high quality engraving. Made from 5mm thick jade glass, the Jade Glass Bevelled Crescent is a large curved glass plaque with a deep bevelled edge and large face perfect for personalisation. Available in 2 sizes, the Jade Glass Bevelled Crescent has a large rectangular face that can be engraved to display your choice of text and/or logo engraving, making this a special personalised gift or premium business award. Made from the finest 5mm thick jade glass and set on a beautiful wooden base, the Jade Glass Bevelled Rectangle on Wood Base is a premium rectangular plaque perfect as a personalised award or gift for any occasion. 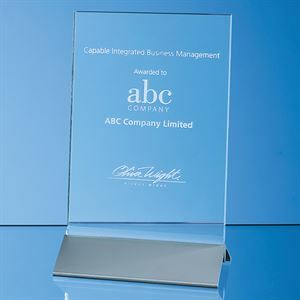 Cut with a bevelled edge, the glass plaque can be engraved to display your choice of text and logo engraving, making this a suitable display piece for any achievement. The addition of an optional satin lined gift box makes this an exceptional way to present your award. The Jade Glass Bevelled Rectangle on Wood Base can be purchased with or without personalised high quality engraving. The Clear Glass Bevelled Rectangle with Easel Backing is a premium 5mm thick clear glass plaque with an easel style backing. Available in 4 sizes, the Clear Glass Bevelled Rectangle with Easel Backing can display your choice of personalised text and logo engraving, with optional colour infilling for a high contrast finish. 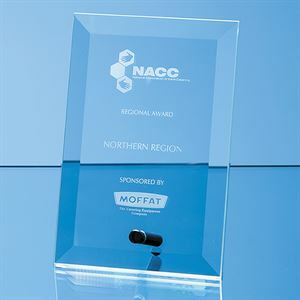 Suitable for display horizontally or vertically, the Clear Glass Bevelled Rectangle with Easel Backing is superb as a personalised gift or award and is supplied in a free presentation box. The Clear Glass Bevelled Rectangle with Easel Backing can be purchased with or without personalised high quality engraving. The Clear Glass Rectangle on an Aluminium Base is a superb rectangular clear glass plaque with an angular aluminium base. Available in 3 sizes, the Clear Glass Rectangle on an Aluminium Base can be personalised with high quality text and logo engraving, making this the perfect personalised gift or award. 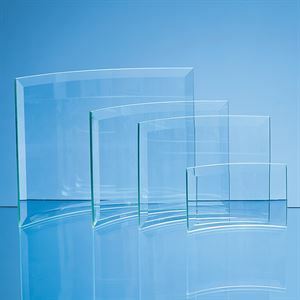 The Clear Glass Rectangle on an Aluminium Base is supplied in a free standard skillet box or a satin lined presentation box is also available to add a special touch. The Clear Glass Rectangle on an Aluminium Base can be purchased with or without personalised high quality engraving. The Jade Glass Diamond Plaque with Chrome Pin is a diamond shaped jade glass award set on a chrome pin stand. 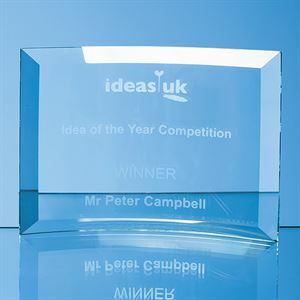 Made from 6mm thick premium jade glass, the face of this diamond shaped award can be engraved to display your choice of text and logo personalisation. The Jade Glass Diamond Plaque with Chrome Pin is presented in a FREE skillet box, or for an extra special touch a satin lined presentation box is available. The Jade Glass Diamond Plaque with Chrome Pin can be purchased with or without personalised high quality engraving. 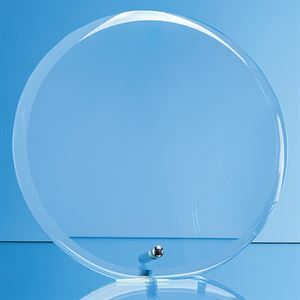 The Jade Glass Circle Plaque with Chrome Pins is a circular 6mm thick jade glass award with smooth edges. Set on two chrome pin stands, giving a sturdy base, this circular plaque can be engraved to display your choice of text and logo engraving. The plaque can be supplied with an optional satin lined presentation box to create a stylish gift or award for any special occasion. The Jade Glass Circle Plaque with Chrome Pins can be purchased with or without personalised high quality engraving. Made from 10mm thick jade glass, the Jade Glass Bevelled Crescent is a curved crescent shaped freestanding glass award with a rectangular face. Detailed with bevelled edges for a premium finish, the Jade Glass Bevelled Crescent can be engraved to display your choice of text and logo personalisation, making this a stunning gift or award for any occasion. The Jade Glass Bevelled Crescent is available in 4 sizes and supplied in a free skillet box with the option of upgrading to a satin lined presentation box to create a special gift. The elegantly designed superior quality pewter goblet is spun by the Wentworth Pewter company in Sheffield Britain. With a capacity of 190ml and 100ml respectively, the Bell Pewter Goblet is available in two sizes. Ideal premium gift or award, this beautiful goblet is finished with a bright polish both to the inside and the outside, making it ideal for engraving. To guarantee authenticity, quality and craftsmanship, the large goblet is touchmarked on body near rim and the small goblet is touchmarked on base. Part of our Wentworth Pewter range, this brilliant gift is handcrafted by pewter experts in Sheffield, UK. Founded in 1949, Wentworth is a leader in pewter crafting, offering a range of tankards, baby gifts, tableware and trophies for any occasion. Pewter has a unique combination of qualities ensuring the highest quality gifts that will stand the test of time. The Bell Pewter Goblet can be purchased with or without personalised high quality engraving. For gifts or awards with engraving, simply enter your text in the personalisation section below and upload your logo now or email it to us later. We will email a free artwork proof for your approval before production begins. This goblet comes with a FREE cardboard presentation box as standard - If you require an upgraded silk lined presentation box, please select your presentation box below when selecting your personalisation options.